Depending on your age, the three Phegopteris species may be more familiar as members of the genus Thelypteris (and to many of us are recognizable under both classifications). They have many common characteristics including a fuzz of clear needlelike hairs, a pair of vascular bundles (looking remarkably, at their base, like peanuts in a shell), creeping rhizomes (or erect rhizomes with roots that produce creeping runners, a botanical distinction), and deciduous fronds. Currently Phegopteris is recognized as a separate genus based on a bipin-natifid frond structure, usually with sessile (stalkless) pinnae, especially in the upper portions. 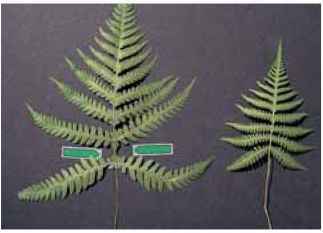 However, even farther back in history it was lumped with Polypodium because of its creeping rhizome as well as the lack of indusia. In the mid 1800s French botanist Antoine Fée determined that based on a number of botanical details, including having only two vascular bundles, Phegopteris was distinct. Under one name or another these ferns have been meandering around in gardens and botany ever since. The species are all temperate and, like their Thelypteris counterparts, ready to colonize, sometimes needing restraint, in the woodlands of various zones from the chill of Zone 3 to the comforts of Zone 9. 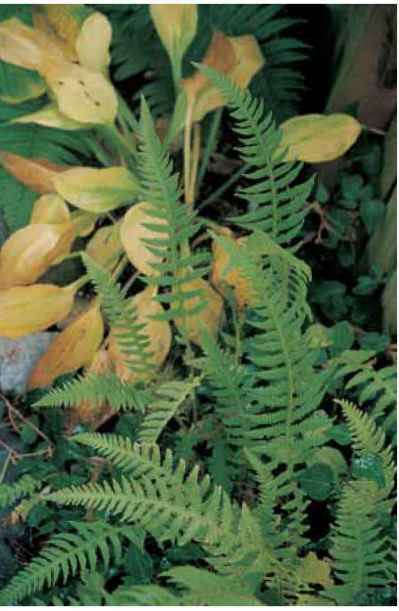 Rhizomes or runners creep, frequently in moss, just below the soil surface and, with an allotment of shade, moisture, and somewhat decent loam, beech ferns are an undemanding assortment of deciduous ground covers. I find them especially attractive in a natural setting enhanced by well-placed pieces of silvery driftwood accents. Or use them within the framework of a stumpery. They will wander about but can be trained for design and effect. Removing an offending or exuberant extension of rhizome-runner and foliage will give you, or your friends, a new plant and will not affect the health of the parent plant. These ferns are readily reproduced from spores that are carried in round to oblong bundles of sori without indusia. As noted, division is a reliable option and brings "instant gratification" with the ease of re-entry for the excised section of rhizome and fronds. Phegopteris connectilis meanders around driftwood in the Horder garden. Phegopteris hexagonoptera (left) and P. connectilis (right). Note significant pinna attachment on P. hexagonoptera. beech trees. In cultivation, these ferns are indifferent to the type of shade tree overstory. Deciduous, 8 to 15 in. (20 to 38 cm).Zones 2 to 8. Apogamous. description: The rhizome is short- to long-creeping. Slender, rounded tan-green stipes are wrapped in hairs and narrow scales and are one-half or more of the frond length. Pinnate-pinnatifid to bipinnatifid blades are triangular with 12 to 15 pairs of softly downy, thin-textured pinnae carried horizontally. Significantly the lowest pair is smaller, points downwards and forward, and is not fused to the rachis nor winged to the pinnae pair above. (Pinnae on Phegopteris hexagonoptera are connected by wings.) Upper pinnae are broadly attached to the rachis, however. Sori without indusia are submarginal. range and habitat: The northern beech fern is very common in cold temperate zones, heavily populating mountain slopes, woodlands, and mossy rocks across northern and eastern North America and Eurasia. It prefers moist acid soil but is adaptable and, once established, amazingly drought tolerant. culture and comments: Grow this low creeper in shaded rock gardens, to define foregrounds of borders, unify tangled stumperies, or wherever a mass of light greenery enhances the garden. New fronds emerge throughout the summer. Although slug precautions are advised, their threat should not discourage planting this cover. It is extremely cold tolerant, but does not adapt to heat such as that of the southern United States. Epithet means "wings running down the stem." Deciduous, 1 to 2 ft. (30 to 60 cm).Zones 4 to 9. Phegopteris decursive-pinnata in the Kennar garden. A patch of Phegopteris hexagonoptera at the Mount Cuba Center. Double-sided openings on Phyllitis sori. description: The rhizome is erect with, depending on the friability of the soil, short- to long-creeping root runners. 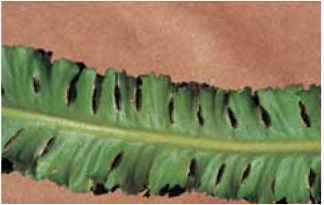 Short stipes, with fine hairs and scales, are the color of new mown hay and usually one-fourth of the frond length. Upright, pale green, narrowly elliptic blades, tapering at both ends, are pinnate-pinnatifid with 18 to 25 pairs of hairy pinnae. The pinnae are broadly attached to the rachis and connected to each other by wings of foliar tissue (a defining measure of the species). Round to oblong sori are without indusia and are medial on the pinnules. range and habitat: This species is the Asian member of the genus with populations in mountains, woods, walls, and rock crevices from Japan, China, and Korea to Thailand, India, and the Himalayas. 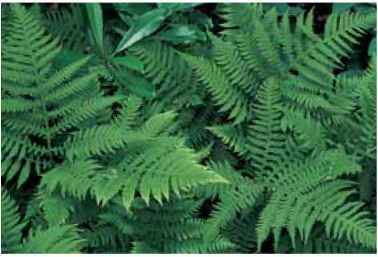 culture and comments: Easily established in light shade and moist woodlands, this fern is suitable for gardens from the warmth of northern California to the testing winters and summers of eastern North America, Britain, and Europe. With its upright soft foliar swords, it is a welcome ground cover, easily providing a green summer understory lasting well beyond the first frosts. Phegopteris hexagonoptera Broad beech fern, southern beech fern Synonym Thelypteris hexagonoptera Epithet means "six-angled wing or fern." 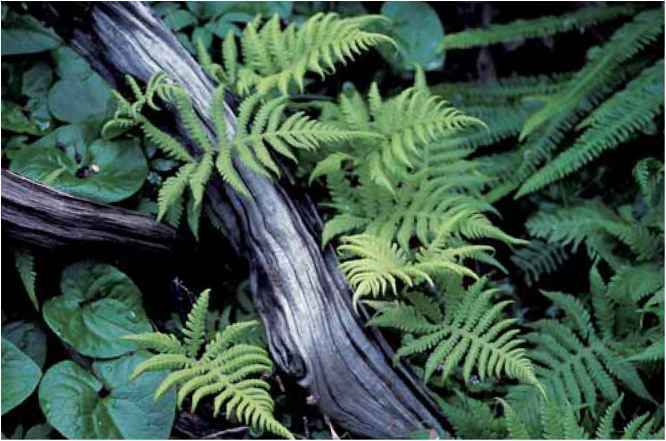 Deciduous, 1V2 to 2 ft. (45 to 60 cm).Zones 5 to 8.
description: The rhizome is long-creeping, creating large stands of fern forests in moist woodlands. Tall stipes are buff-colored, hairy, and up to one-half of the frond length. Broadly triangular blades are bipinnatifid with 10 to 15 pairs of pinnae. Lower pinnae are the widest, extending in true triangular form from the base of the blade. All pinnae are broadly attached to the rachis and connected to each other by wings of foliage, a significant measure of identification. (Phegopteris connectilis has the lower pinnae pair distinctly "unconnected"to adjacent pinnae.) Sori without indusia, but occasionally with small unicellular hairs, are close to the pinnae margins. 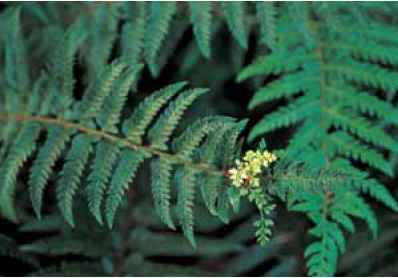 range and habitat: The broad beech fern is endemic to eastern North America where it grows in acid soils in northern states, but more abundantly in the southern coastal tier down to Florida. culture and comments: This species is easily introduced to shaded and moisture-rich gardens in Zones 5 to 8, where it can be slightly aggressive but is easily controlled by judicious "pruning." It is one of the last ferns to unfurl in the spring, but will produce fronds throughout the summer. Like its cousin Phegopteris connectilis, it too carries a slug alert, especially when tender and tempting young fronds are emerging. 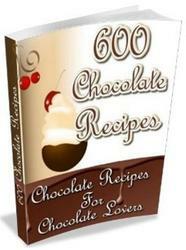 Plant it in moist sites. Poor soil will restrain its spread somewhat. Hu-musy soil will encourage more vigorous growth. Your choice.